An over the top swing will put you in some unfriendly territory. Amateur golfers often suffer from the over-the-top golf swing. With an over-the-top golf swing, you may have an inside swing path during the backswing, but as you go in to your down stroke, the shoulders rotate and the club goes outside of swing path. This causes the golfer to have to come back in on the ball at impact, causing a slice or a pull. One of the drills for those who have an over-the-top swing path is to dramatically change the swing path to an inside down stroke, almost over-exaggerating the move in order to keep the club inside. To do this, you can draw a fish on the ground using white spray paint--or just visualize one. The head of fish should correspond to your takeaway and downswing, with the thinning of the tail representing where you ball is. As you come up with the club, keep your shaft running along the top of the fish's back. When you reach the top of your swing arc and start down, make sure that you club is running along the belly of the fish prior to impact. This will keep your club inside, creating an outside in loop in your backswing. Because your club starts to the outside and then comes back inside in an over-the-top downswing, one of the keys is becoming aware of how far out your swing is coming in to impact. To become more aware of how far out your club is, and to correct it, set a plastic water ball 2 inches outside of your ball and about 4 inches back from your ball. As you go in to your downswing toward impact, if you are swinging over the top, you will make contact with the plastic bottle before you hit the ball. As you practice the bottle drill, you will begin to have better control over your swing path and be able to keep your club head inside on the downswing. If you don't allow your body to move toward the target at the start of your downswing, your shoulders will try and compensate, thus creating the over-the-top swing path. Another exercise you can focus on before you go out and play involves making sure that your lead thigh moves toward the target as you start your downswing. 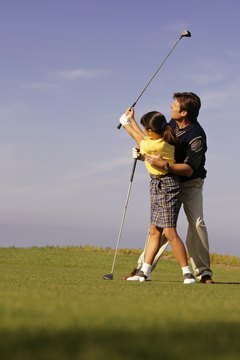 You can do this just by simply running your hands through the motion of the golf swing and making sure that your lead thigh moves toward target right at the point where your downswing begins. In this way your body will start the move and your shoulders will be less inclined to create additional space for the downswing by going out.